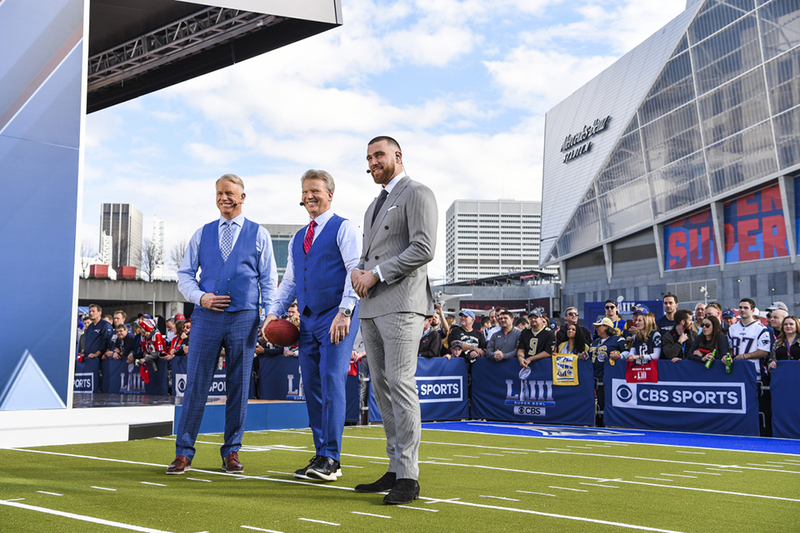 For the CBS broadcast network coverage of Super Bowl LIII in Atlanta, the network used three main sets designed specifically for the coverage. Inside the stadium, a mezzanine level set served as home base for key coverage of the game and featured elements that echo the unique geodesic angular design of the Mercedes-Benz Stadium while also playing tribute to the CBS eye. This set, designed by Jack Morton Worldwide, featured a retractable roof that could raise about four feet to allow better sightlines of the field during broadcasts. On either side of the set were two large polygons of LED video panels, which mirrored the stadium design as well as the other angular elements used throughout the broadcast. 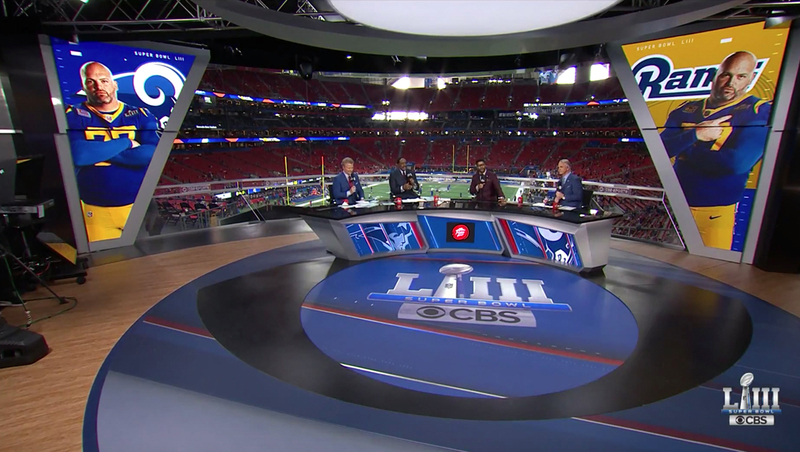 In addition to the design team at Jack Morton, Mystic Scenic Studios provided fabrication services for the CBS Super Bowl sets, with stages provided by Filmwerks and lighting design is Beth Fowler. The desk itself also featured additional LED panels set inside of three polygonal “fins” that added dimension to the front of the desk. In addition the desk was set on the edge of an oversized element made of printed graphics and LED panels in the shape of the iconic CBS eye logo. Above the desk was a curved header with lighted element that also play homage to the “eye” look. 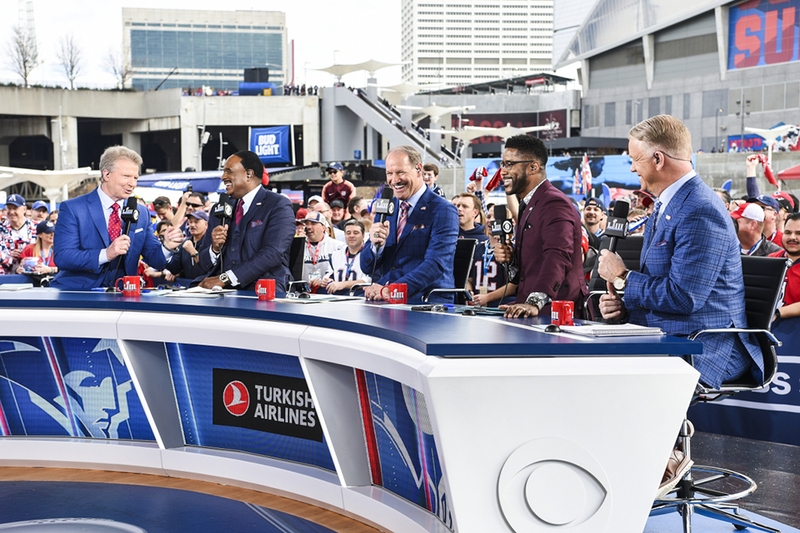 Wrapping around the edge of the mezzanine set was a glass and metal railing created using polygons of edge lit glass and topped with a frosted CBS Sports logo band. The polygonal shapes in the Mercedes-Benz stadium were mirrored in the stylized proceeded player interstitial bumps CBS used to introduce each team and during other parts of the game. 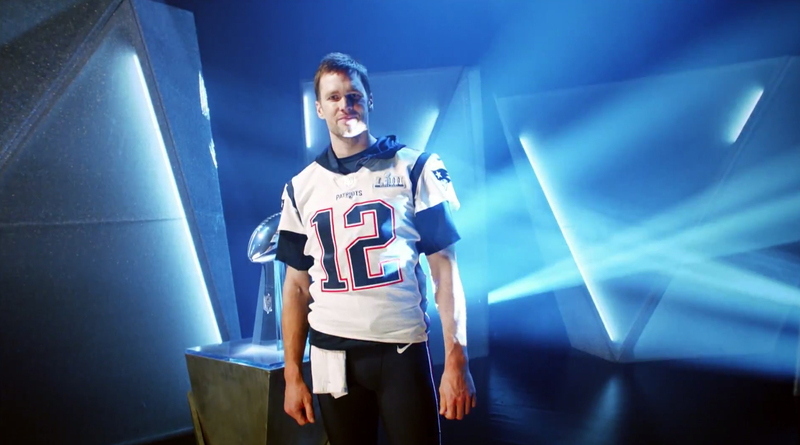 In these shots, players from both the Patriots and Rams appeared in front of dramatically lit angular scenic elements with additional angles created using focused beams of light. 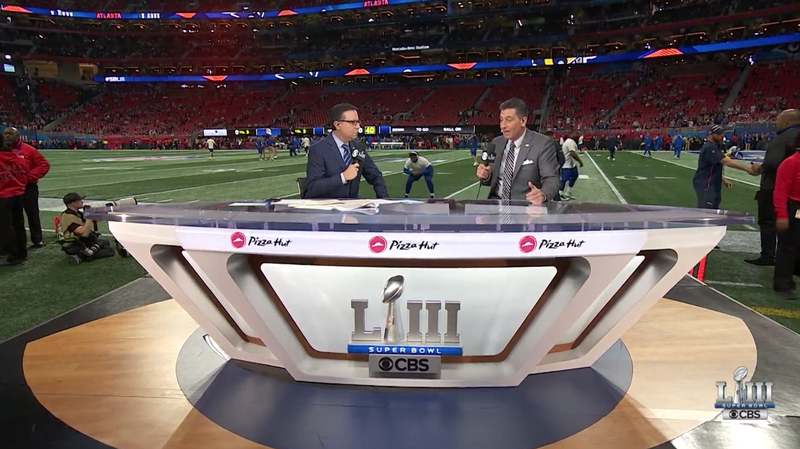 Jack Morton also provided a collapsable field-side anchor desk that featured a wood toned riser with the CBS eye created thanks to black overlays. The desk itself boasted strong angles and a dimensional Super Bowl LIII logo in front. Meanwhile, outside the stadium, CBS has a large outdoor setup that included an anchor desk backing up to the open plaza. The front of this desk featured video panel insets and bold diagonal lines. Photo courtesy Mary Kouw/CBS. The outdoor area also included a mini football field. 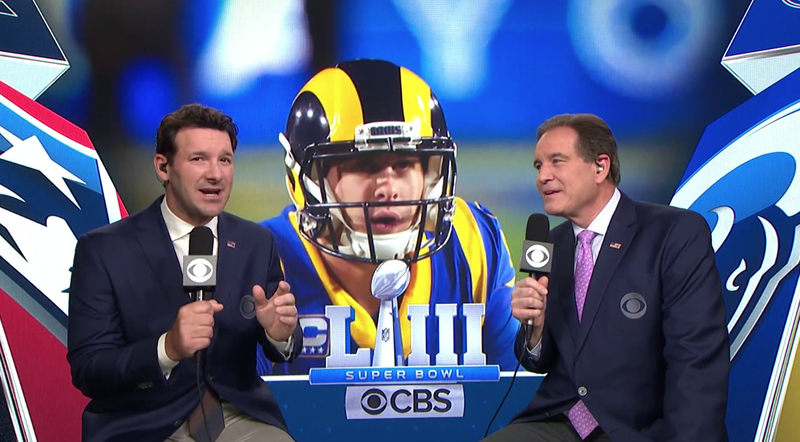 CBS also had a video wall setup inside the play by play booth, which was typically used to show a large graphic with both the Patriots and Rams logos and the Super Bowl logo in the center. The roughly wedge shaped space between these elements, meanwhile, could be used to showcase topical footage as well as generic graphics. The booth also featured a set up that allowed the commentators to appear with the field behind them, as well as ‘working’ desks designed to give them access to computers, replay monitors, notes and diagrams while having a clear view of the field. During some points of CBS’s coverage of the game, the commentators were shown on camera using these desks.